Heading north after a fantastic foray into the Slavic world, we paused briefly in Salzburg (Austria) and Munich (Bavaria, Germany) for two nights in each. Not enough time, but enough to give us a taste (mostly of beer, wurst and schnitzel). On the docket: a kids’ opera, a salt mine, a crazy palace, and a soccer stadium. And beer, naturally. Unfortunately, as (bad) luck would have it, our AirBnBs in both Salzburg and Munich had fallen through a month prior – the only times that’s happened to us thus far. It was a good reminder to always keep a backup plan in mind. I was able to find a decent AirBnB substitute in Salzburg, albeit in a somewhat random location but with a very nice and accommodating host. In Munich, we ended up in a Novotel – generic by my standards, although to my amusement, the kids ADORED it and declared it one of the best places we stayed all year. Sigh. SONG. Every summer, Salzburg celebrates music and drama with a month-long festival. To the chagrin of the other members of my family, I felt we really needed to include this on our itinerary. Salzburg has a rich history of music, and if the city takes pride in a certain area, I feel it’s important to see what it’s all about. The festival has a great option for families: a one hour children’s opera; this year, it was the Fairy Queen for Children, which was a hilarious kid-friendly adaptation of Shakespeare’s Midsummer Night’s Dream. Joining local families all dolled up in their traditional Austrian best (dirndls for women and girls and lederhosen for men and boys), we seemed to be the only non-Austrians there. The set was lovely, the actors funny (even in German!) and the operatic voices absolutely gorgeous. We all loved it – really! Plus, we had a little nosh and a drink afterwards at one of the oldest restaurants in the world (1200 years old – not a typo! ), St. Peter Stiftskeller. SUDS. That night, we strolled across this scenic city right through the Mirabellgarten – familiar as one of the Sound of Music settings – to the fantastic Augustiner beer garden. Great beer (obviously), atmosphere and food. The only downside was the thick haze of cigarette smoke – still ever-present in Europe, with Salzburg and Munich the worst we encountered. But the overall experience was worth it. SALT. 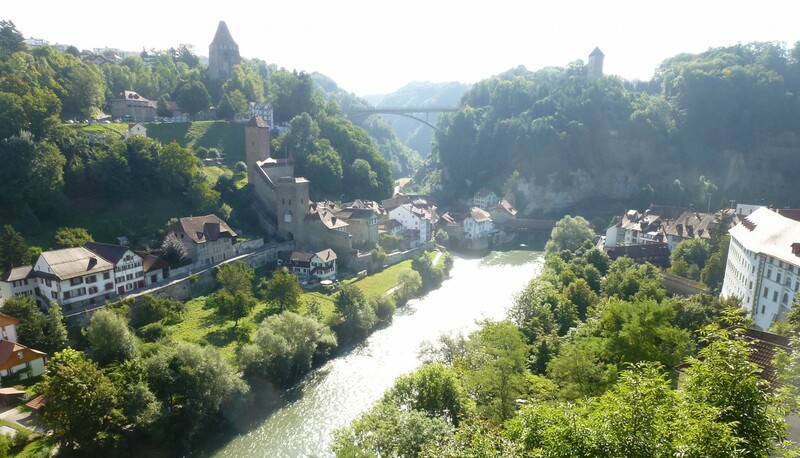 I was really looking forward to the next day, a repeat of a day I had 30 years ago with my sister Sally and my mom: the salt mine in Hallein and Schloss Hellbrunn, which is one of the most kid-friendly castles in Europe. Salzburg literally means “salt fortress,” reflecting its history of salt-bearing barges yielding great wealth back in the day. Visiting a salt mine remains just as fun as I remember it: visitors don a mining outfit and hop on board a little train for the descent deep into the mine. The best part, though, is the sliding. The miners really used them, and I can’t imagine that there wasn’t a part of them that enjoyed that little thrill breaking up the monotony of the work. SOAKED. I hadn’t given much of a preview of our next stop to the boys, so they thought we were just visiting any old palace. Schloss Hellbrunn, however, is a ton of fun. Built in 1613 by an archbishop with a curious mind and a wicked sense of humor, the palace and grounds are rife with “trick fountains” that catch visitors then and now by surprise. The kids started catching on and fully embraced the spirit, ending up soaked to the bone. We adults had a blast watching them while mostly dodging the spray ourselves, but honestly, I found myself fascinated by the marvel of engineering. Hundreds of years old, these “water automats” and other “water-operated tricks” are quite impressive! In addition, the grounds are really beautiful – great place for a picnic – with a fun playground for kids and the real Sound of Music gazebo to boot! I highly recommend this stop for families. 30 years ago: I was caught by surprise! Water-powered mechanical theater built in 1750 – amazing! SOCCER. Leaving pretty Salzburg behind, we drove back into Germany for a bit more of Bavaria. The Novotel in Munich is just like any other Novotel… but that is to say that it’s a good value for families and very kid-friendly, as well as well-located. After checking in, we headed back out to check out the Allianz Arena, home of FC Bayern – Fritz’s favorite soccer team. While I, for one, think the rise of “stadium tours” is a total racket, the boys and PapaHatch thought it was cool. I truly enjoyed the museum at the end – it was really well done. Particularly interesting to me was the Jewish roots of FC Bayern and its anti-Nazi history – and subsequent challenges due to Nazi retribution. Because of the stadium visit, Fritz proclaimed Munich as his favorite city in Europe. That night, we embraced the cheesiness and went to the famous 400+ year old Hofbräuhaus and met an old friend of mine from my high school days. Great fun to catch up, drink excellent beer, soak up the festive atmosphere and eat enormous quantities of beer hall food. Andreas, great to see you! On Saturday, we traipsed all over town, joining the throngs to take in the requisite chiming of the Glockenspiel and then heading to the wonderful and huge Englischer Gardens. The highlight was watching the river surfing (for experienced surfers only!). Super cool; I’d never seen anything like that. Short and sweet, our visits to Salzburg and Munich by no means did justice to Bavaria (and Bavaria-like Austria), but we all enjoyed these pleasant cities before heading into France for the last third of our summer trip. River surfing in the Englischer Garden – really fun to watch!